Have you ever tasted something so delicious it sent you straight back to your childhood or reminded you of an entirely different dish? This was my exact experience when I popped one of these energy bites into my mouth. I thought, “Wow, this tastes like cake batter – like vanilla cake!” And thus, these vanilla cake bites were born. These aren’t your average cake bites. They’re made with 6 wholesome ingredients and are oil-free, grain-free, and refined-sugar free! Yep, exciting stuff. Let’s get started! The base of this recipe is dates, which are blended into a sticky ball and then set aside. Next come your dry ingredients: walnuts, coconut flour, and almond flour. Pulse into a meal and then add your dates back in. Before you know it, you have cake batter on your hands (you know, healthy cake batter). All that’s left to do is scoop, roll into balls, and indulge. You can also choose to leave them unrolled for a more rustic “cookie dough” vibe. Either leave plain or roll in coconut flakes for the ultimate healthier treat. Personally, we loved the addition of coconut and highly recommend it! These would make the perfect snack or healthier dessert! We loved enjoying a couple midafternoon with some tea or golden milk. Swoon. For more energy bites, check out our No-Bake PB & J Energy Bites, Peanut Butter Cup Energy Bites, Dark Chocolate Hemp Energy Bites, and Mango Energy Bites! 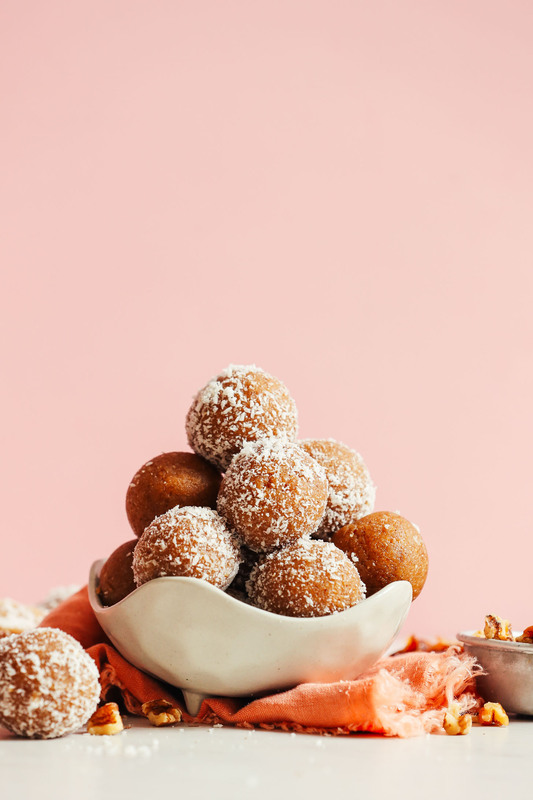 If you try these cake bites, let us know! Leave a comment, rate it, and don’t forget to tag a photo #minimalistbaker on Instagram. Cheers, friends! 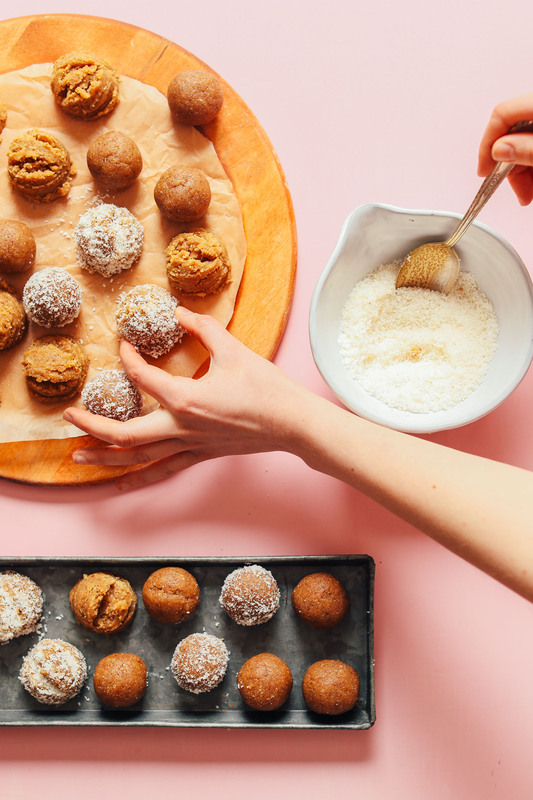 Energy-packed date & walnut cake bites infused with vanilla and coconut. The result is an easy-to-make, tender snack bite that tastes like vanilla cake! Just 6 ingredients and 1 food processor required! Add pitted dates to a food processor and mix until small bits remain or a ball forms. Remove from food processor and set aside. 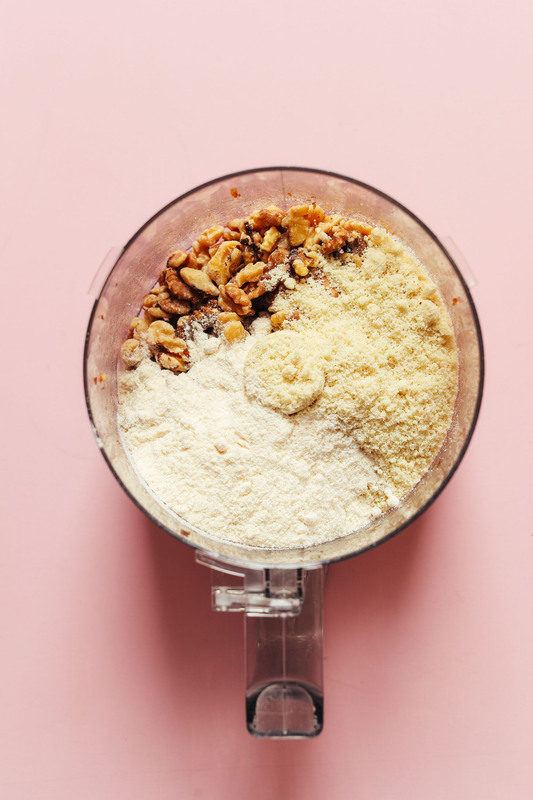 To the food processor, add the walnuts, almond flour, coconut flour, and sea salt. Blend until a semi-fine meal is achieved. Add dates back in (in bite-sized pieces) as well as the vanilla extract. Pulse until a loose dough forms. Be careful not to over-blend. You're looking for a pliable dough, not a purée. Scoop out 2-Tablespoon amounts using a cookie scooper (like this one) and roll into balls with hands or release lever on scoop and place directly on a parchment-lined baking sheet. Repeat until all dough is used up. Roll in finely shredded coconut or leave as is. Store in refrigerator or freezer. Will keep in the refrigerator up to 1 week or in the freezer up to 1 month. You could also press the "dough" into a loaf or 8x8-inch cake pan and slice into bars. *Can sub 1/2 tsp vanilla powder or paste per 2 tsp vanilla extract. *Nutrition information is a rough estimate for 1 of 16 bites without optional ingredient. *Recipe inspired by my girl Shut the Kale Up and adapted from the lovely Alison Wu's Walnut Cardamom Bliss Balls. Can you use this without almond flour? Double up on the coconut flour maybe?? I’m allergic! That may work, but you will likely have to experiment to get the right texture since coconut flour is more dry and dense. You could also try oat flour in place of the almond flour. Hope that helps! Just made these and my son and I, both vegan, liked them. I can’t say they taste like vanilla cake, but they’re good. He’s having some friends over for Valentines for dinner (five days from now) so I decorated some with red icing sugar and some with pink candy hearts. They look really cute. I also added chocolate chips to about half the batch and rolled those in chocolate sprinkles. My son preferred those. :) Thanks for these. I’m sure we’ll make them again. 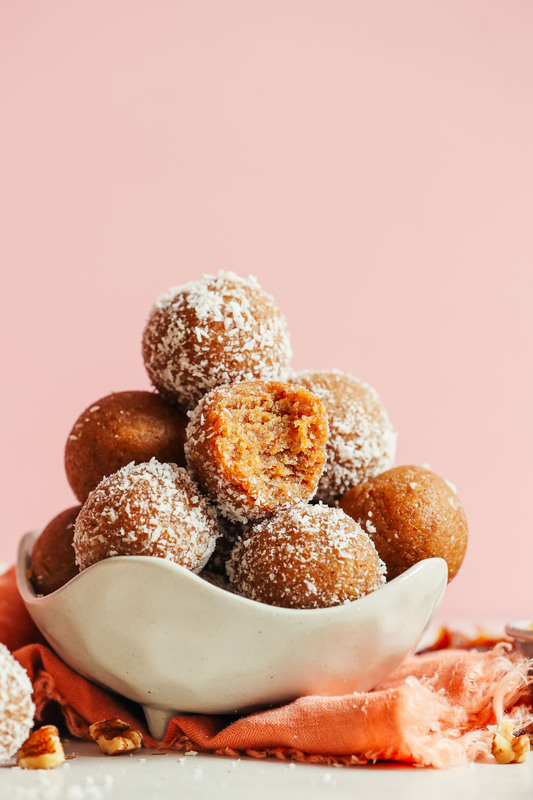 I made these vanilla cake bites and me and my husband really enjoyed them and they are so versityle. Like changing the flavors! Thanks so much we will have these a lot! Hi there! I have coconut flour so I’m good there, but I don’t have almond flour at home. I have oat flour and brown rice flour. Would either be similar? If not – I have no problem getting almond flour but wanted to see if either would be an acceptable substitute to save some $$. Hi Jamie! I think oat flour would work! 10 Stars – unbelievably delicious and addictively so! I have made a new batch every day for 5 days, they go so fast. I think lemon rind would do the job perfectly without affecting the texture. Hello, What a wonderful recipe. Would this be good for a person with Type 2 Diabetes? Great question, but we don’t like to give out nutritional advice. Please consult with your doctor to see if this recipe is a good fit for you. These really do taste like vanilla cake! I did have to add some moisture to the end product to get them to roll into balls. I used all almond flour. I think the blanched almond flour, plus salt and vanilla, really give these that cake ball flavor. Trader Joe’s makes good almond flour in a bag. These remind me of vanilla cake mix, but in a pleasant way. Will make these many times, I’m sure. I’ve made these 3 or 4 times over the past two months. They are delightful and are a hit with anyone I share them with (although the folks at the gathering I took them to all opted for sans-coconut shavings version). I used to be a little weird about coconut and never liked anything with coconut shavings, but I make these with coconut now. They are dense, so I usually drink lots of water with them. Tip: I’ve found that 1.25c of dates is around 21-23 soaked in warm water for 10+ minutes and then pitted medjool dates. How do you measure the ingredients – with a scale using grams or with a US customary cup? I find that my metric measurements can be off by as much as 50% from the US customary measurements with certain foods (like the pitted dates). Hmm, interesting! I use cups and convert to metrics online. I came across this recipe as I was searching for a way to use up some dates I have had for a while and I have to say that these are some of the best little bites I have made in a long time!! I am always trying to incorporate healthier snack options into my life and these are perfect!!! My entire family loves them (they were gone within 24 hrs) and that is saying something because they don’t eat healthy AT ALL!! This would be great for kids birthday parties or any get together!!! This looks amazing! I don’t have a processor but a vitamix. Do you think it will work fine with that as opposed to the processor? It will probably work but we haven’t tried it. Our vitamix doesn’t seem to do well with dates. But if you try it let us know how it goes! I just attempted to make this recipe today. I didn’t have almond flour, so I figured I’d just use raw almonds. I threw all of the ingredients in and turned on the food processor. Because I didn’t follow the recipe perfectly, they did not turn how exactly right. But they were delicious!! Almost like a Lara bar, but much better!! It just shows because you are so thoughtful with your recipes and spot on with the flavors, even if they don’t turn out exactly as they should, it will work! Thank you for all of your great recipes and all of the time it takes you to perfect them! These are healthy, yummy and easy! Yay! My kinda recipe! I only had half a cup of almond flour so I sub’d the rest with coconut flour, which was drier than the original recipe so I added 4 tablespoons of soy milk. Perfect! Yay! Thanks for sharing your recipe changes, Kate! These turned out amazing! So delicious! Followed the recipe exact. Thank you! I do need a bigger processor though, mine was too small so I made it with the vitamix and it took a long time because of all the scraping. These were really easy and very good. Will use this recipe for a quick company treat. Absolutely delicious in a mystifying way! So few ingredients, so fast, so delicious, and a guilt-free way to give in to my sweet tooth. Love these! This recipe is genius!! Only change I made was use more almond flour instead coconut flour because I didn’t have any. Texture was perfect for shaping the balls. The addition of the shredded coconut was delicious. My hubby loves this. No more Larabars in my house with this energy bites. Thanks for an amazing snack recipe. I made these but my dough is not moist. Not sure what went wrong. Did you make any recipe changes, Anu? Were your dates dry? If so, I’d recommend soaking them next time (and then drain thoroughly). Hope this helps! Yep, just like some of your readers, tasted like cookie dough to me so I added chocolate chips. I happen to love cookie dough so these are right up my alley. Simple, easy and delicious. The recipe popped up into my inbox the other day (and let’s be real, I stalk this website, so I saw it there first), but made this recipe yesterday after seeing these on your IG stories. This recipe was amazing! I made with all almond flour. My husband who doesn’t like cake loved these! He kept saying they tasted like cookie dough. Next time, I will add some chocolate chips in his for a sneaky treat. This recipe, like all your others, is just PERFECT as is. Thank you, Dana! Yay! We are so glad to hear that, Annie! OK, I just have to add an update. I like to throw in a handful of chocolate chips for my husband. I’ve actually started splitting the batch and making chocolate chip ones for him and coconut ones for me. I’ve also played around with adding some pumpkin pie spice, my fav is the classic og. Thank you so much for this amazing recipe! It’s become a go to, like all your others! What would be a good substitute for dates to make this Keto? Almond butter? Sugar free syrup? Any other ideas? Hmm aside from another dried fruit which would work nicely, I am not sure! If you try using almond butter or another substitute, report back. Good luck! Hello, just made these and putting them in the fridge now. I would just like to say how much I love your design. The font & layout of your recipes is clear and visually appealing, as are ALL of your photographs. I’m a meat-loving, non-allergy baker and food enthusiast (who tries to be healthy and do some vegetarian cooking), and I am drawn to your recipes because they look so dang good. Kudos! These are really tasty! I only used 1 tsp of vanilla, but might try more next time. I also subbed GF flour for the almond flour and had to add 3 tbsp of liquid to moisten the dough. Satisfied my sweet tooth! Glad to hear it, Hilary! These are absolutely PHENOMENAL. I made them for my husband and I as a treat and they taste just like vanilla cake! But I prefer a slightly more dense texture that leaves you more satiated & has health benefits! I love that we used walnuts and there was no processed sugar! You could sub less vanilla for a lighter flavor also. Definitely a dessert recipe I will be keeping on hand from now on! Thank you!! Also, I added a dash of cinnamon and dipped half of each ball in dark (70%) molten chocolate, which I would totally recommend! Yay! We are glad these were enjoyed all around, Ann-Sofie! Just made these. Love them! I didn’t have medjool dates, just pitted dried dates that I buy bulk from my local organic nuts ‘n seeds place. I poured a little (about 3 tablespoons) boiling water over them and let them stand, covered, for about 10 min to soften. The whole mixture ended up a little dry, so I added the soaking water and it worked perfectly! Healthy deliciousness. Thanks, Dana! Do you recommend making these wonderful cookies to sell? These would be a great treat to sell at a bake sale or fundraiser, Julia! Thank you for another exciting and fun recipe! I put them on a popsicle stick so kiddos enjoyed the ‘cake pops’ even more! Half batch I coated with shredded coconut and the other half in hemp seed. Delicious! ? Wow! 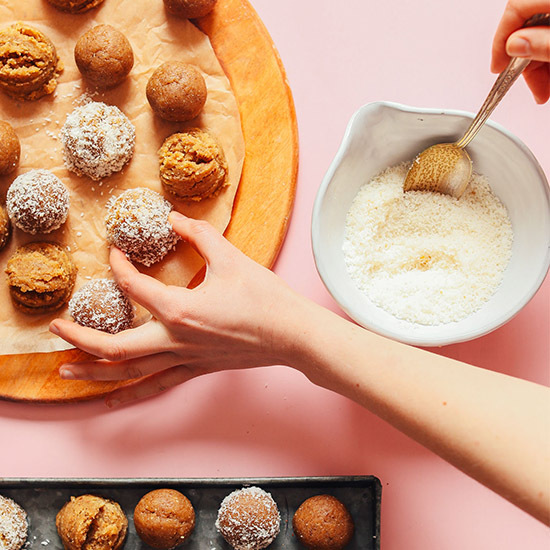 I am so excited to make these no-bake vanilla cake bites, Dana! Loving the way you have added alternative options on some of the ingredients in the recipe. What amazed me even more was the option to automatically adjust the ingredients depending on the number of servings we prefer. Very well done! I’m impressed! This was an excellent recipe and so easy. I dusted it with cinnamon which made them extra yummy. Loved this and will make it again. Hi! I am not sure what happened there. Do you have a good quality food processor? If anything these are incredibly moist, not crumbly. Perhaps your dates were dry? See the notes for a fix to that problem. I made these tonight… I was so excited but they were so crumbly. Could never get dough to form. I tried to do it by hand and they taste okay but definitely not the texture in the video/photos. Did anyone else have an issue? Hmm, not sure what happened there. Do you have a good quality food processor? If anything these are incredibly moist, not crumbly. Perhaps your dates were dry? See the notes for a fix to that problem. Made these tonight, my family really enjoyed. I kept some plain, some with coconut flakes, and drizzled some in dairy free chocolate served with strawbrries. Definitely satifised our cravings! Thank you! Whoop! Thanks for sharing, Nicole! Do you know of a good substitute for almond flour in baking? I can’t have almonds, but I can have other nuts. Yay! Glad you love them, Caroline! I made these tonight and loved the taste and texture. But as a previous poster mentioned, the oils started coming out from the nuts, so much so that my fingers are almost dripping in grease, which to me is an undesirable quality. Should I try adding more coconut flour? Did this happen to anyone else? Hi Christine! Yes, this can be normal and a little frustrating. What I’d recommend is adding in a little more coconut or almond flour and stirring instead of pulsing/mixing. Then roll as instructed. Hope that helps! Glad you loved the flavor and texture! YUM! Made these according to the recipe, they were super quick to make and hit the spot when I was craving a sweet bite. I put them in the fridge and actually prefer them cold, but they are delicious either way! Hello! This looks delicious! I don’t have dates or other dry fruits on hand, but I do have maple syrup. Any thoughts on whether or not it would work or how much to use? Hi, wondering if you could sub a food processor for a vitamix? It will probably work but I haven’t tried it. My vitamix doesn’t seem to do well with dates. But if you try it let us know how it goes! These are fabulous. I made these and the peanut butter cup energy bites this afternoon. They are the perfect “bite” to take with you to the gym for a little pick-me-up. Super simple. Thank you! Lovely! Thanks for sharing, Vanessa! I just made these and they are amazing!!! I did change out the walnuts for pecans. Soooo good! Delicious!!! I was not expecting this to really taste like cake batter but it does! The texture is so smooth and chewy- just perfection. I LOVE the method of blending the dates separately from the dry ingredients. This saved my food processor so much work and kept the motor from burning out as it usually does when I make recipes like this. Thanks for another wonderful recipe! Curious is you think I could make some some meal by grinding almonds first, and then use this in place of the almond flour? I have coconut flour but no almond flour. But I do have whole raw almonds. Or I could also make oat flour to sub in for the almond flour. These look so good! Thanks!! You can do that, but it will have a heavier more intense almond flavor. It should work though! Made this tonight. It was amazing. I was not able to find almond flour. I sifted almond meal to make my own almond flour. Totally agree with the cake like texture. I find using medjool dates has a better taste. I was really excited to make these! I was a little disappointed as I made them exactly as written and I didn’t think they tasted like cake. They reminded me of a cookie dough bar that I’ve had before so I added in some chocolate chips (about 3 tablespoons of semisweet ones). I also tried to roll them in coconut but it didn’t stick so I just added that directly to the mix. In the end they tasted pretty good, just not what I was expecting. :) Also we thought they tasted better after they’d been frozen a bit. P.S. This is my first comment. hehe I love your recipes so much and I always think “hey, I should leave a comment” and I never do. Well now I did. Yay! Thanks for sharing, Kendra. They don’t taste “exactly” like cake, but it certainly reminds me of cake batter. Glad you still enjoyed them! Hi! I recently made this recipe. While they were delicious, as I was forming the dough into balls, the dough became super wet – like I could squeeze liquid out of them. Did this happen to anyone else? Again tasty, but I’m wondering if that was the desired result? Bridget, this can be from either over-blending the mixture or if you soaked your dates and they retained some of their water. Next time, pulse instead of blend when you get to the end. I’ll add a note of that in the recipe. Thanks for sharing! These were delicious. Keen to try them out with hazelnuts maybe. And also might try adding some cocoa. Do you think it would work out nicely? Should I decrease the amount of flour od adding cocoa? To be safe, I’d reduce the amount of flour only slightly to start, but I actually don’t think you’ll end up needing to in the end (it’s a pretty moist mixture). I’d suggest adding 1/4 cup cacao or cocoa powder! I wanted a really quick dessert to make after work last night and made these almost exactly as written. I didn’t have coconut flour so just used more almond flour. Also they were just a little bit not sweet enough so I mixed coconut with some sugar before rolling them in the mixture. Overall I personally love them but they were not a hit with my kids, who said they are too rich. I don’t think they really taste like cake – there’s more of a fudge quality to them. But I will probably make them again for myself, maybe a half recipe or else I’ll end up eating them all! They’re very easy to throw together and a pretty healthy option for dessert. Think that I might have over processed…i have a high-speed blender and just can’t seem to stop the walnut oil from seeping. I was thinking I was looking for a dough ball…I’ll know next time to stop a bit earlier. Adding more almond or coconut flours isn’t helping unfortunately…but they taste lovely. Hmm, yes perhaps they were over-processed. It’s rare, but dates and nuts can get oily when over-processed. Hopefully they were still salvageable. Hi, I wonder if these could be made so that they are chocolatey? would you suggest subbing in cocoa powder? Thanks! I’d suggest adding 1/4 cup cacao or cocoa powder to the mix! I was craving something after last nights dinner and remembered this in my inbox – made it so quick and loved it so much! So does my 2 yr old : “more cookie ball, please mommy” Another 5 star review! Thank you! Oh my gosh I love you! I had to give up sugar (so no happy right now) but this I can do and I will be a life saver. Thank you! ??? Made these last night for my coworkers. I couldn’t stop sneaking bits of the dough while I was making them…it tasted like cookie dough! Everyone at work was impressed with how great they tasted without any added sugar. My only changes were to use all almond flour (no coconut flour) and I subbed cashews for the walnuts. Will keep this recipe on hand for future events! Yay! Thanks for sharing, Karina! I loved them. But mine were bit hard and oils came out. What could be the reason? Oils coming out is a totally natural thing as nuts have oils. You can just add a little bit more almond or coconut flour to dry them out. They shouldn’t have been hard though. Perhaps your dates were dried out? I followed the recipe exactly and rolled in coconut. Fantastic!! Totally satisfied my sweet tooth and tastes like a gooey cake pop. Yay! Thanks for sharing, Kinara! Not gonna lie, I’d TOTALLY just press the dough in a cake tin and freeze it for a few hours to make a giant date-based birthday cake. It’s a lot easier than rolling them into balls! LOL! But anyways, these look absolutely remarkable. Would cashews also work with this recipe instead of walnuts? These look so delicious! The fact that they are no-bake is perfect for my spring time laziness haha. What other nuts do you think would be a good substitute for walnuts? See recommendations in the above comments! I always wonder, can prunes be substituted for dates? Also, these would probably be really good rolled in cinnamon sugar. I would think so! Let us know if you give those variations a try. Right? So glad that worked out! Thanks for sharing. These are incredible! Barely finished making them before I started devouring them. I subbed cashews, since I didn’t have walnuts and they were still amazing. Thanks for your wonderful recipes! Ha! Yay! Thanks for sharing, Lauren! Made these yesterday and they are DELISH!! They are the perfect vanilla flavor and the texture reminds me of a cake ball. Will definitely be making regularly as a snack/sweet treat! You should edit the title to point out that these are gluten free. I almost didn’t click the link because I thought they weren’t. Now that I see they are I can’t wait to make them! Oh funny! We’ll consider that! Almost all of our recipes are gluten-free at this point, FYI. TG for that! You’ve become my go-to recipe blog. Love that idea! Thanks for sharing, Taryn. Hi Dana! I am looking for a food processor (mainly to make more of these type of recipes). I see that you have added a link here to a food processor on Amazon. Do you think this is a good buy? Thanks for your advice! I do! The Cuisinart has lasted me at least 7 years with no problems and it works like a charm! These look so delicious! My husband is allergic to dates, and I was wondering if the dates could be replaced with something else? Another dried fruit would work nicely! So kind! Glad you liked them, Caroline! Is there any way I could use almonds instead of walnuts? and another flour combination so that the whole recipe isn’t just almonds? How about cashew nuts or hazelnut? I think cashew or hazelnut could work! Cashew being preferred. Or even macadamia! Made them earlier and stored them in the fridge for a few hours and just tried them. THEY ARE SO GOOD! I only had hazelnut flour so i used that in place of almond flour. Tnaks for the recipe! coconut and almond flours don’t have to be baked! Cool, yes? Almond flour is just ground almonds in a very fine, flour-like grain. It’s also typically blanched. Almond meal is close, may not be blanched, and I consider meal to be a slightly larger grain than flour. Coconut flour is simply dried, de-fatted coconut “meat.” I look forward to trying this recipe! If I can fool my teen boy who shuns any “gluten-free crap,” I will have made my summer (and his, he loves cake-pops)! Oh shoot, does other flour need to be baked?! How fun would it be if you added some colorful sprinkles for a “fun-fetti” vibe! Could be great for kids bday parties. Thanks for the recipe, and for just being all around rad! Hi, this recipe is great! My son has various allergies and thankfully loves these. He cannot eat almonds so I substituted it for all coconut flour but it seems to come out dried than that what it is supposed to. What can I add to inclide more moisture/better consistency to the mix? Try using less coconut flour. It dramatically soaks up any available moisture compared to almond flour. Start with half and see what your mixture is like then just add a tbls at a time until you just form the dough. I am familiar with both flours and generally use *roughly* half when subbing with coconut flour. I added about 3 tbsp of water (I subbed GF all-purpose for the almond). The ground nuts add a lot of oil to this recipe, so I would think that you could add some coconut or avocado oil if you’re skipping the nuts…. just my thoughts after making the recipe as directed…. which is awesome! After making have of the balls, we added some chocolate chips to change it up! YUM! Do you think I could use pecans instead of walnuts? I’m sensitive to walnuts, but these sound yummy! I would love to know also? I always sub pecans for walnuts since my kid is allergic. I’ve never had a problem in any recipe I’ve tried. I say go for it. I will be! Could I use all-purpose flour instead? Hmm, I’m not sure how that would turn out. But if you try it let us know! I used GF all-purpose in place of the almond flour and had to add about 3 tbsp of water to make it more batter-like (would have used a plant milk instead, but ran out this morning). 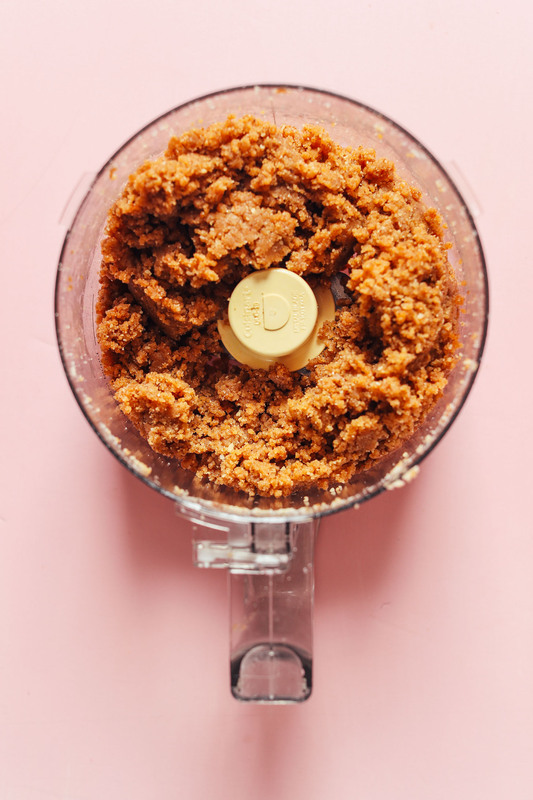 I may have over-processed, though – my food processor is tiny, so I had trouble getting it all mixed until I took all of the recipe out and mixed it in small bits. Really tasty!! I have an almond allergy, but I am also gluten, soy, and egg free. I am really struggling to find new gluten free, vegan recipes these days because almonds have become the ‘it’ ingredient in gluten free recipes. 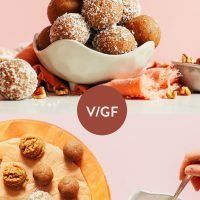 I recognize that swapping out the almond flour for something else will change how these turn out, but does anyone have any suggestions for an ingredient that can be used instead of almonds? Pulsed sunflower seeds? Sub for more of the coconut flour? Pulsed pecans? Suggestions are welcome. Thank you! I think a seed meal could work nicely here. Or even hemp seeds. The reader above is going to try oat flour, which I think might be another good alternative! Could wholemeal rice flour could be used instead of almond flour to still get that cake like texture? I wonder if this might work for those who are allergic to almonds. For those who are allergic to almonds, Betty Crocker make a boxed cake mix that’s easy to do and tastes just great, baked or raw! Would a pulsed seed meal work to replace the walnuts? If so, what would you recommend? Thanks, Dana! I LOVE your recipes!!! Lori, I could see maybe sunflower seed meal, or hemp seeds, or even coconut flake working here. I also have a terrible nut allergy so I’m really hoping that more recipe creatures start featuring nut alternative/ non-nut based options! I’m trying to go vegan so please share with me any of your go to subs for almonds! ? My friend is allergic, and she always replaces almond flour with tigernut flour. I’ve only tried it a couple of times (and loved it! ), but she has done it many times. I recently ate cakes and pies at a lovely specialized bakery back home, they usepulsed pumpkin seeds, in some doughs – mixed with milled walnuts, in some milled oats. Sooooo tasty! wow this would make the perfect snack for when u crave cake but want a healthier quicker alternative! will definitely try this soon. do u think i could sub oat flour for the almond flour? The almond flour does provide a “cake-like” texture in combination with the coconut flour. But in a pinch I think oat flour would work! I used oat flour and it worked really well! Great! Thank you for letting me know! I can now eat these as an on the go breakfast ? Do I need to soak dates or nuts first? Only soak the dates if they’re very dry (then drain thoroughly). I wouldn’t recommend soaking the nuts.